How do you find the x-coordinate of a point on a line if you have another point and the slope? You'll need to use the slope formula. Watch this tutorial and see how to find this missing coordinate! Want some practice finding the y-intercept of a line? In this tutorial, you're given the slope of a line and a point on that line and asked to find the y-intercept. Watch this tutorial and see how the equation for the slope-intercept form of a line is used to figure out the answer! Word problems are a great way to see math in action! 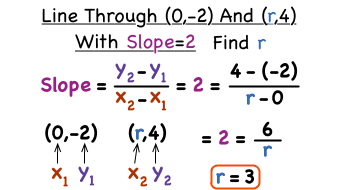 This tutorial shows you how to solve a word problem involving rise and run by using the slope formula.